Set out the game board and the four character card boxes: Creative Cat, Data Head, Star Performer, and Word Worm. 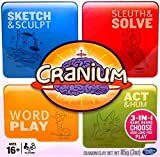 Set out the mover pieces, die, timer, Cranium Clay, Cranium Cubes, pencil, and paper. Divide into two teams. Each team chooses a mover piece and places it on start. The team with the player whose birthday is coming up next goes first. 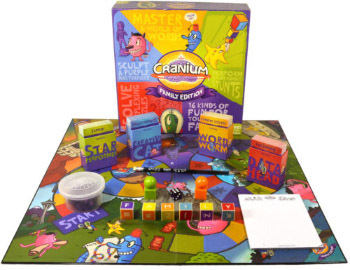 In Cranium Family Edition, you roll the die at the end of your turn, after you successfully complete an activity. The color of the space your mover piece is on matches the color of the Cranium activity card you'll play. At the start of the game, or any time you are on a purple space, your team can choose from any one of the four card boxes. Have the other team draw your card and read it out loud to you, taking care to hide the answer on the back of the card. When you're ready, have the other team start the timer. Your team must try to successfully complete the activity before time runs out. Roll the die and move the number of spaces you rolled. If you started out on a Lucky Star, you get to move twice the number you rolled! Your turn is now over. Your turn is now over. Wait until your next turn to try again. 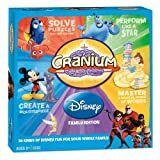 If your team is the first to cross the finish line, Congratulations, you've won Cranium Family Edition.